After years of research and development, we have successfully developed a product that is both tough on stains and odors. Unlike our previous products, our new product uses enzymes and bacteria as active ingredients. Enzymes are a catalyst which enable natural reactions to occur. In simple terms, enzymes are able to separate two things that are already bonded together. A great example of this would be a stain on your carpet. Once the enzymes separate the stain from the carpet, natural bacteria takes over by consuming them. Once the work of nature is complete, all that is left is a fresh blue sky fragrance! Try it for other stains around the house, including pre-soaking those stubborn stains before they go in the washing machine. 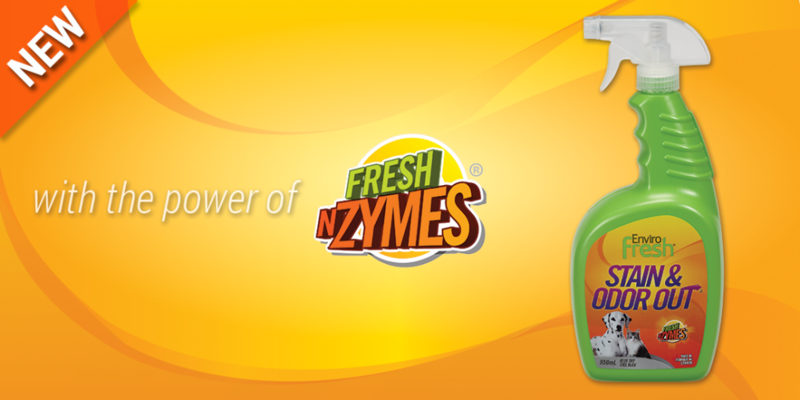 If you love our other products, you will love the power of Fresh N Zymes! ← NATIONAL PET DENTAL HEALTH MONTH – FREE SAMPLES!